We've included information below for the questions most often asked, along with examples and additional links. If you are unable to find the answer to your question, please let us know. Every web browser has a folder where files are stored for every web page you visit. The files are images, style information, etc., that tell the browser how to display the page. Every time you visit a web page, your browser checks to see if it has a copy of the files already stored in the cache, which allows it to display the page faster. This can be really great, until you find yourself trying to view a change on a web page that doesn’t seem to show up even though you’re sure you saved it. Because browsers are all a little different, there’s no one set of instructions for clearing your cache. However, you can find very helpful information specific to your browser by visiting refreshyourcache.com. Is there a way to view statistics on visitors to my website? Can I use gmail to check and send email from an email account I have here? 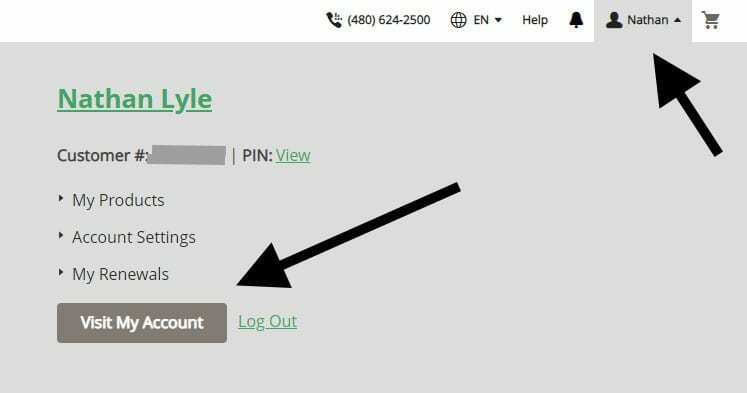 How can I access my domain account if I don't have the password, pin number, or access to the email account it's associated with? If your domain name is registered with us at maestrodomains.com, and you’ve lost access to the account, you’ve got two main options to pursue. If you think you may have the 4 digit pin #, call the registrar support at (480) 624-2500. 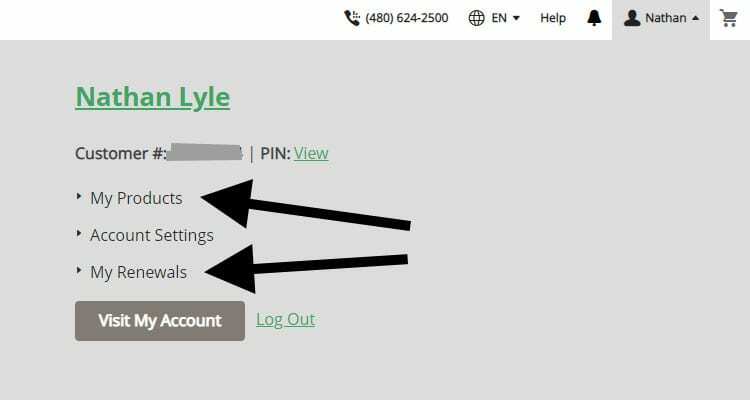 If they can validate the account with a pin, they can assist with changing any contact info and change the password so you can regain account access. Request an account update through changeupdate.com. This will involve uploading proof of identity, usually a driver’s license, possibly some documentation regarding business ownership depending on the situation. NOTE: if your domain name has expired and you currently are unable to log in to get your payment information updated, you should do the above as quickly as possible so that you’re able to renew your domain within it’s grace period. If you don’t already have your domain name registered, but you have an idea of what you want, we recommend not waiting. Good .com domains are hard to come by these days. You not only have to compete with legitimate businesses and organizations, but “domain squatters” will also grab names in the hopes of selling them at a higher price. If you already DO have a domain name registered, it’s always best if you register any new domain names on the same account to keep as organized as possible. If you’ve already registered some domain names elsewhere but would like to consolidate them with us, then you can register a new domain name here and we can assist in transferring your previous domains. If your domain name is registered with us (at maestrodomains.com) then your renewals are set by default to happen automatically. You do have the option of disabling the auto renewals, in which case you would need to renew them manually to not lose them. You’ll see a Renew Now button in either location that will let you submit the renewal. How can I update my credit card information on my domain account? Click the Account settings menu, and then select Payment methods. Next to the card you want to use, click Edit. Make any needed changes to the card (expiration date, name, etc.) and then click Save. I’m seeing a charge from "dnh domain hosting services", is this legit? If your domain names are through our domain store (maestrodomains.com) then that is the name that will show up on your statement for domain name related charges. Our domain store is managed through GoDaddy’s reseller program, and “dnh domain hosting services” is their generic payment processing descriptor. PLEASE NOTE: If you found this page through a web search, but have never worked with us here at My Web Maestro on a website, it’s most likely that the charge is related to another reseller and not us. It’s also possible your card information was stolen and used to make a purchase with GoDaddy or a domain reseller. If you’ve worked with us at any time in the past, please contact us and we’ll try to help track things down. IF YOU ARE NOT ONE OF OUR CLIENTS, PLEASE CONSIDER CONTACTING GODADDY DIRECTLY AT (480) 505-8877. How do I add a new payment method to my domain account? Click on your name at the top right of the screen, then click the Visit My Account button. Complete the on-screen fields for the payment option you’d like to include. 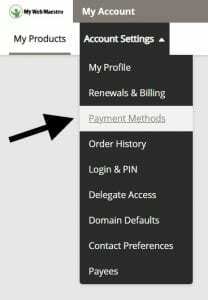 You may also want to go to Account Settings then Renewals & Billing to confirm that your domains are assigned to the correct payment method, in order to avoid any billing issues. If you have a domain name through us, at MaestroDomains.com, payment is typically made directly to the registrar via the payment method you put in place. All other services (hosting, design, etc.) are invoiced via email from us, and will include links to allow for making payment online. Please note: when paying an invoice for web hosting or any other recurring payment online, you can choose to have future payments drawn automatically (there should be a checkbox allowing you to opt in for automatic payments.) If you select this option, you would then receive an email in the future upon successful payment, or if the payment failed to go through. Read more information and instructions on how to set up automatic payments and manage invoices. 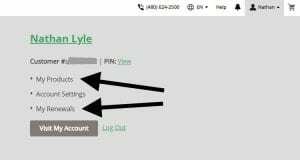 Can I set up automatic payments for future billing? Domain names or domain related products at MaestroDomains.com will automatically bill your saved card information unless you specify otherwise. The domain store’s billing is separate from all other My Web Maestro service billing. If you are being billed for any non-domain subscription-based service with us (hosting, maintenance plan, etc.) you can easily save your card details (look for the checkbox during payment) so that you are automatically billed each time you are invoiced. PLEASE NOTE: At this time, recurring payments work on a per recurring invoice basis. This means if you have two individual repeating invoices with us (for example: one for hosting and one for maintenance, that are sent out separately from each other) you will need to set the automation for each one. If you set the hosting to be automatic but not the maintenance, it only affects hosting. If you don’t want to enter your card info every time you make a payment, you can also opt to store your card details at the time you make any online payment, to make future payments easier.